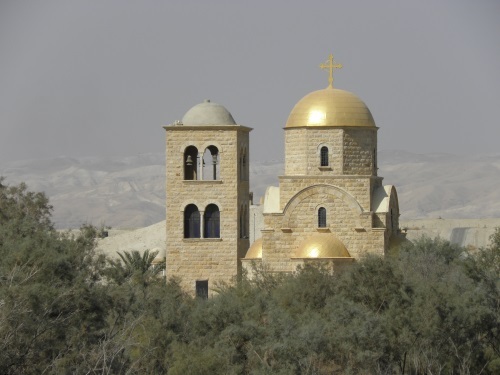 The Baptism Site "Bethany Beyond the Jordan" (Al-Maghtas) is a Christian pilgrimage site commemorating the location where Jesus of Nazareth was baptised by John the Baptist. Map of Baptism Site "Bethany Beyond the Jordan"
Against my own expectations and contrary to some bad reviews of the "experience" on the internet, I quite liked my visit to Bethany beyond the Jordan. I am not a religious person so I did not feel anything special about walking here in the footsteps of Jesus. Neither did the people who were part of my instant tour group (access is restricted to a guided tour because you're right at the border). We were all a little bemused about the muddy creek that once was the mighty river Jordan. We looked down into the actual site where Jesus was baptized, a spot which hasn't held any water for ages (see photo). We kept our eyes on the various churches and monasteries that have been built here by different Christian groups. Some of them are very recent. It reminded me of Lumbini, where a simple place of memory (birthplace of Gautama Buddha) now is turned into a large complex of temples and monasteries of all Buddhist denominations. Highlight without a doubt is the "confrontation" with the other side - at an about 3m wide stretch of the river, we ended up face to face with tourists and pilgrims that are doing the same trip, but then on the Israeli side of the border. 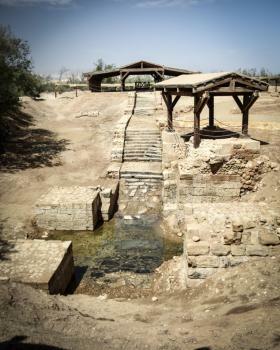 Click here to see more of my photos of Baptism Site "Bethany Beyond the Jordan"
Interesting site. My guide provided a good explanation about why this site is considered the baptism site (archaeology dating from the first centuries after Jesus's death). You're required to go on a tour with the visitor's center. There's a short walk to the actual site. I saw the Jordan River, the baptism site, the new Orthodox church, and the gift shop. There were many religious groups there to celebrate and baptize each other. 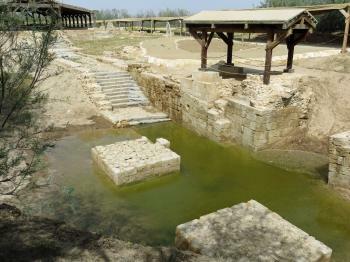 The Baptism Site at Bethany Beyond the Jordan (Al-Maghtas in Arabic), where Jesus was baptized by John the Baptist, has quite an extensive biblical history. Tradition has held this location as the site where the Israelites first crossed the Jordan River to enter the Promised Land, as well as the site where the prophet Elijah was taken into heaven in a chariot of fire (commemorated in the song "Swing Low, Sweet Chariot"). 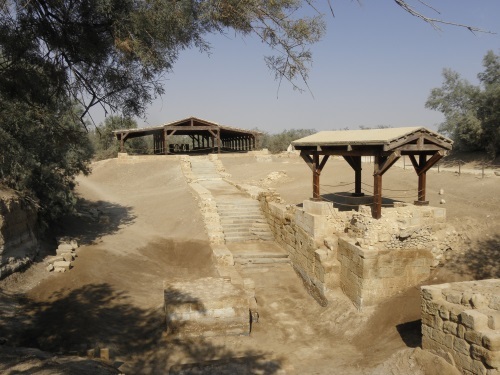 But it is because of its history as the baptism site of Jesus that pilgrims have made their way to Al-Maghtas, as well as to Qasr el Yahud, on the Israeli-occupied west bank of the Jordan. When I visited Jordan in March 2015, I was aware Al-Maghtas was on Jordan's tentative list to be voted on at that year's session of the World Heritage Committee, so I made a point to go there. As others have noted, a visit requires an official tour, where visitors and pilgrims are taken by bus to see the excavated site. 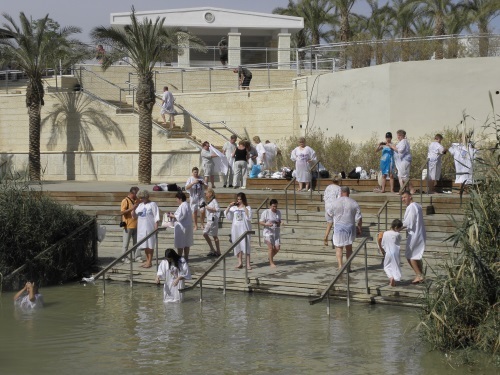 A further walk leads to the muddy Jordan River, where pilgrims across the border were being baptized. Although I enjoyed my visit from a biblical and historical perspective, I wasn't confident there was enough OUV for the site to be inscribed. I'm glad it was, though, and I hope one day politics allows an extension for Qasr el Yahud. Logistics: The Baptism Site is not far from the Dead Sea or from the city of Madaba, but requires private transportation. All visitors must sign up for a guided tour at the entrance to the site. This site I visited before it was a UNESCO Site. I thought of it as a minor site, because i'm not really religious but it's quite nice to see! I thought to just quickly drive by, see it, and go onwards: NOPE not going to happen. YOu have to take a tour, and this takes time. I probably spend 2 hours on the site? No way to go back earlier. This is done because it's in military zone. The place was actually drive. but nice covered with the remains to see. The nearby jordan river you could take a bath if you wanted. Quite some military when i visited (end 2014). Read more from Chris here. I visited Bethany beyond the Jordan with a tour guide when travelling from the Dead Sea towards Israel and Palestine in . It was interesting to visit especially if you're a religious person. Crossing the border to Israel was like entering a war zone. Heavily armed military personnel searched each and every vehicle and used mirrors to inspect beneath every car or coach for explosives. All in all, I fail to see the OUV of this site as it doesn't contribute much. It is just one of the various Catholic sites spread around Egypt, Jordan, Israel and Palestine. I visited this TL site on a rainy morning in November. They is no bus. I had a car, it is well signe-posted on the Amman-Dead Sea highway, about 10 km from the Dead Sea Resort hotels. Because it lies on the border with Israel-occupied land, you need to go on a guided tour. Price is 12 JOD (abour 15 $). Included is an audio guide in several languages. Then we boarded a bus that drived us past the hill where prophet Elijah ascended to heaven in a chariots of fire (there is not much to see and they didn't let us leave the bus). 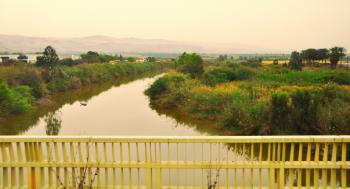 Then we were left off on a 1 km trails that leaded us to the Jordan River. It was 50 m wide 50 year ago. It is now a 2 m wide mudy small stream. It also marks the border. Then is the remains of several churches and the site where Jesus is supposed to have been baptized. It lies on a dry branch on the Jordan river. Then we got a bit furher near a (modern) russian orthodox church, and then to a place where we could go down to the river itself. Just across the river, is the Israeli equivalent tourist facilities. It seemed a bit strange to visit a small stream, with Jordan and Israeli (relaxed) soldiers facing each other and looking over us. For those who want it, you can actually immerge yourself in the river. The place is probable very important on a religious point of view, but I am skeptical about its OUV. It makes a good visit for a rainy morning near the dead sea. 85 Community Members have visited.